You may try to exercise as hard as you can, but if you don’t control what you eat, your results may not be the way you want them to be. What improves fitness is the input you give to your body. Beachbody knows that fitness is not only exercising, but proper nutrition, too. That’s why every one of their Programs include nutrition guide. I have a fitness and nutrition degree, with vast knowledge of exercise and solutions to get in shape. That’s why I know that without the right nutrition plan you can only achieve 20-30% of your results. But, to get the rest you’ll have to eat properly, according to your fitness efforts. That’s what Beachbody and Toni Horton know, so with experts’ help they have designed the P90X Meal plan according to the workout phases. It is a three phase nutrition plan that provides the right food so that you endure throughout the workout plan and build your body the way you want it to be. The meals will fuel your body with enough calories and nutrients so that you feel full and have the energy to complete the workouts with easiness. But, this is not a meal plan unique for all. It’s a meal plan that is fully customizable for everyone to create according to their needs. It’s because not everyone is built the same and one size does not fit all. is a diet high in protein, low in fat, and low in carbohydrates. During this first phase, you may notice significant loss of energy from the lower carbohydrates, but also significant weight loss. is similar 40% carbs, 40% protein, and 20% fat. is nicknamed an athletic diet for this reason: unless you have extremely low body-fat levels, you should avoid this phase of the diet entirely and stick to the Energy Booster phase or you’ll likely add unwanted body fat. The P90X Meal plan will fit well into anyone’s eating schedule – five meals: three main meals and two snacks a day, and is fairly easy to follow, especially once you figure out your portion sizes. The start of this Meal plan is Phase 1. However, you decide how long you stay in each phase. It’s recommended you go through each phase, but the time you take with each one depends on your daily caloric needs, energy level and previous eating habits. If any of the phases make you feel not ready to go with the workouts, you should consider changing the phase and fuel your body properly so that you are able to finish P90X workouts. Fat Shredder is the first Phase of the meal plan. It’s the start of the Meal plan and the start of P90X. That’s the phase when you will shred the most body fat because the diet is mostly protein intake, reducing carbs and fat intake. Calories that will enter your body will be 50% from protein, 30% from carbohydrates and 20% from fats. Most of your meals in this phase will consist of vegetables, lean protein and healthy fats. This way of eating will lead to quick losing weight. And because your carbohydrate intake is limited it will decrease water retention and burn fat, because the fuel source: carbs aren’t there. So, if you need more fat and weight to lose you can stay longer in this phase. It’s up to you. Energy Booster is the second phase of the P90X Nutrition. It includes meals that will help you endure in your P90X challenge. Now, you can take more carbs, but the same amount fat as in Phase 1. Calories that will enter your body will be 40% from protein, 40% from carbohydrates and 20% from fats. The carbs intake will provide your body extra energy, thus improve your fitness. This will help you continue with the P90X workouts and not give up because of lack of endurance. Endurance Maximizer is the last phase of the P90X nutrition. After completion of P90X workouts this is the nutrition to keep. In this phase the carbs intake is once again increased, and the fats intake remains the same. So, the calories that will enter your body will be 20% from protein, 60% from carbohydrates and 20% from fats. This is a diet plan that athletes can follow and keep their performance to a high level. It is a balanced nutrition plan that includes complex carbs (for more energy and endurance), lean proteins (for muscles creation) and healthy fats (again for energy). This will help you finish P90X, after you’ve lost the excess weight, and get much stronger. The good thing in the whole Meal Plan is that you have no restriction in how long you stay at any phase. You can be in the first phase for 1 week, or 2 months. It’s up to you and your body how much you want to stay in each phase. It deppends on how you feel and what kind of results you need to achieve. You are advised to customize your plan according to your needs. What should be your guidance are your bi-weekly measurements that shows your progression. They will show you if you need to make changes to your Meal plan. You can find the P90X Nutrition Plan here and use it accordingly. 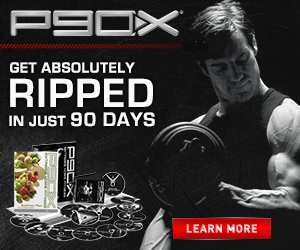 What are your experiences with the P90X Nutrition plan? Do you need any advice? Contact me to get my opinions and advice!